We are surrounded by miracles created in the private sector, particularly in the digital universe, and yet we don't appreciate them enough. Meanwhile, the public sector is systematically wrecking the physical world in sneaky and petty ways that really do matter. 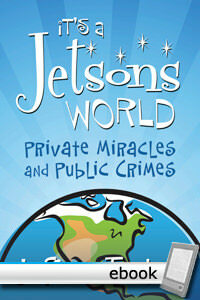 It's a Jetsons World: Private Miracles and Public Crimes from Mises Media on Vimeo. Tucker goes to great length to explain that which we take for granted, that glorious global network of cooperation and exchange we call the market economy and its capacity to meet our every material need. At the same time, he draws attention to way that the government is chipping away at economic opportunity and making our lives a bit more miserable every day. The answer to the problem of private miracles and public crimes is to keep the former and jettison the later -- all in the service of that elusive dream of universal peace and prosperity. This book will inspire love for free markets - and loathing of government.